US, 1956, 178 minutes, Colour. David Niven, Cantinflas, Robert Newton, Shirley Mac Laine, Charles Boyer, Joe E. Brown, Martine Carol, John Carradine, Charles Coburn, Ronald Colman, Melville Cooper, Noel Coward, Finlay Currie, Reginald Denny, Andy Devine, Marlene Dietrich, Luis Dominguin, Fernandel, John Gielgud, Hermione Gingold, Jose Greco, Cedric Hardwicke, Trevor Howard, Glynis Johns, Buster Keaton, Evelyn Keyes, Beatrice Lillie, Peter Lorre, Edmund Lowe, A.E. Matthews, Mike Mazurki, Tim Mc Coy, Victor Mc Laglen, John Mills, Alan Mowbray, Robert Morley, Jack Oakie, George Raft, Gilbert Roland, Cesar Romero, Frank Sinatra, Red Skelton, Ronald Squire, Basil Sidney, Harcourt Williams, Ed Murrow. 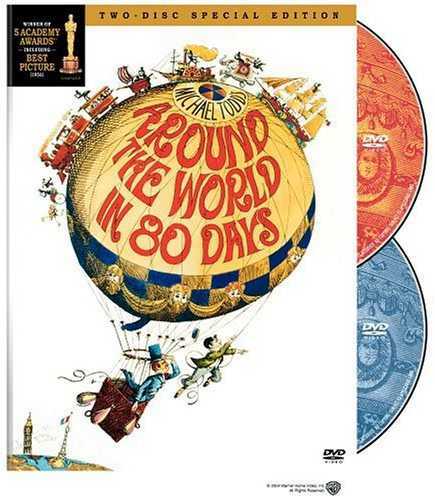 Around the World in 80 Days won the Oscar for Best Film of 1956 (over such films as Giant, Lust for Life, The King and I). It was designed for a very big screen, for an audience who would come away from their television sets and enjoy spectacle, travel, spotting the stars. Now, the film seems to have a great deal of padding for a very thin story - and the stars are not always recognisable. The film was produced by Mike Todd in Todd-AO. Direction is by Michael Anderson (The Dambusters, 1984 were films of his at this time). David Niven is very stuffy as Phileas Fogg. Shirley Mac Laine does not register much as the Indian princess. The comedy falls to Mexican actor Cantinflas. Robert Newton enjoys himself as the British detective. A host of English character actors take the parts of the members of the Reform Club. Noel Coward and John Gielgud get into the act quickly. There are many stars, some appearing momentarily. However, Marlene Dietrich, George Raft and Frank Sinatra in a San Francisco saloon. Jack Oakie has an enjoyable part as the Captain of the Atlantic packet. Victor Young's theme song blends with French, British, Indian etc. melodies. Leisurely enjoyment. 1. The acclaim of the film in its time? Impact now? 2. The use of the Todd-AO screen, spectacle, scenic effects, the 19th century? Special effects? The range of melodies? The theme song? 3. The popularity of Jules Verne, his fantasy - compared with technology and travel now? Phileas Fogg and his place in the Reform Club, the robbery and suspicions, the wager? The strict rules of the club? British style? Fogg and his British Empire attitudes? 'Rule Brittania'? 4. Preparation for the voyage, the employment of Paspatoue, the plans, the crossing of the Channel, the balloon to Spain, the delay with the bullfights, the boat to Marseille, Egypt, the ship to India, the train, the boat from India, Japan, San Francisco and the saloon, the Transcontinental and the American scenes, the Indians, working the railway track, the packet from New York, the mistake of the day? His achievement, mellowing? The princess and marrying her? 5. Paspatoue and his comedy, eye for the women, the bullfights, India and the rescuing of the princess, the siege of the Indians and his falling off the train, about the be burnt? Comic touches? 6. The detective and his suspicions, following the group, his mistake? 7. The princess, the death ceremony, accompanying the group, in love with Phileas Fogg? 8. The club-members, the wagers, the news from Fogg's journey, the servants and their betting? The woman in the club at the end and the poke at the British? 9. India and the end of the line, the elephants, the ceremonies? The adventures in the Wild West? 10. The chopping up of the steam packet to get to England? 11. The range of stars: the British group, Charles Boyer and the French, Gilbert Roland and Cesar Romero and the Spanish, Ronald Colman and Cedric Hardwicke in India, Peter Lorre and others on the ships, John Carradine and those in the saloon, Victor McLaglen? and Edmund Lowe on the boat? 12. An enjoyable yarn, fantasy and spectacle?